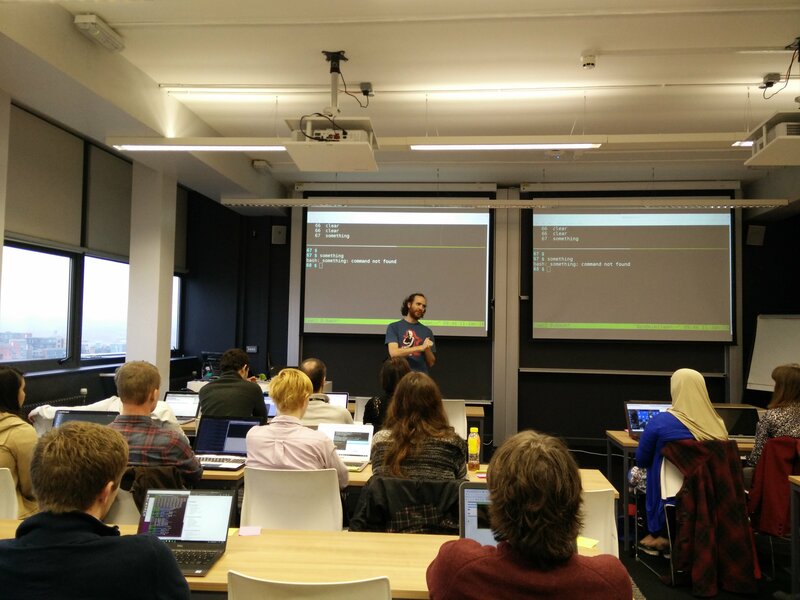 The workshop was taught by four different instructors (Sam, Drew, Stuart and David) with the help of Tom (an Astropy developer) on Thursday. We all brought different expertise and shared the teaching out to keep the workshop lively over a gruelling five days none of us taught more than three hours in one go, and we alternated days between teaching and assisting. We used the red-green post-it technique suggested by software carpentry as a way to know how people were getting on during the sessions, also, for every session the learners were asked to use these post-it notes to give us feedback on the session (green for something good you’ve learnt, red for something that can be improved). This not just helped us for the next workshop, but it also helped to the next instructor that day! As usual there were some software setup issues at the beginning of the week, however we were very close! Only one person from the whole class has troubles with the Jupyter notebook - it simply was not able to execute any command within. We didn’t manage to fix the problem, but probably it was the oldest laptop (running Windows 7) in the class. Beside that case, we come across a couple of other problems with other windows machines, in one of them git log was blocking the screen and the other could not open the text editor (Notepad++ in this case) when executing commit (or merge with the default message). Each day we updated the official repository with lesson templates in Jupyter notebook format, where an outline of the class was available, and the code cells were empty to be filled in while following the lecture. Once we completed a session, the notes can be browsed here. In this way everyone had to fork our repository on github, then pull at the start of every session from upstream and push at the end to their origin. This cemented the work at the start of the week on git+GitHub, while making sure everyone had a backup of all the work they had completed during the week and learning the usual git workflow of contributing to a larger project on GitHub. Thanks to the visualisations on GitHub we can see how all these forks evolved, and see if the participants keep using GitHub!! During one of the sessions we discovered a bug in the latest release of SunPy. We used the opportunity to demonstrate what to do in these cases: fill an issue on GitHub and provide the information needed so the developers can replicate such error. We will be looking to repeat this workshop later in the year, probably before term starts in late September. In the mean time, feel free to use our material and contact us if you want more information.